You guys, there are no words. These tacos are insane. Spicy, saucy, hearty, and utterly delicious. 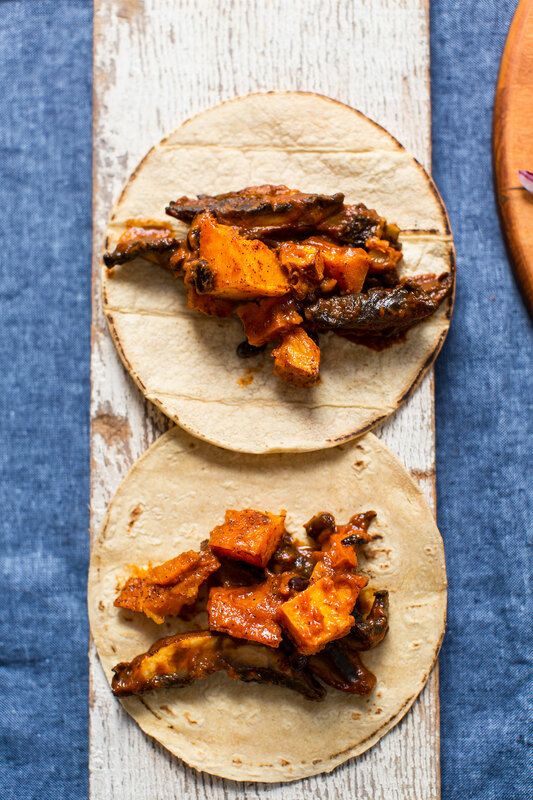 These tacos were inspired by my love for fall and winter squash – especially butternut squash. Plus, they are easy to make, requiring just 30 minutes to prepare. What’s not to love? The core ingredients are roasted, spiced butternut squash and saucy, sautéed portobello mushrooms. Black beans are optional but add an extra boost of protein and fiber, which I’m all for. Let’s talk about the sauce tho. 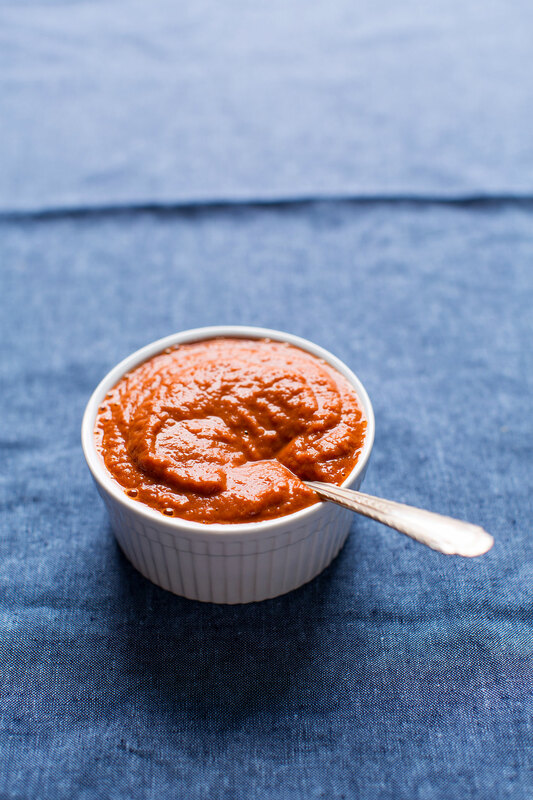 This sauce is adapted from my Chilaquiles sauce from way, way back, that I’ve since adapted into my go-to enchilada sauce. It’s smoky, hearty, perfectly spiced and marries the flavor of mushrooms and squash together beautifully. These would make the perfect dish to serve to guests or to feed your family on nights when you’re all craving a twist on classic tacos. These are delicious on their own, but would also pair well with my Mexican Quinoa Salad Cups, Chipotle Black Bean Tortilla Soup, and Ginger Beer Margaritas. Just sayin’. If you try this recipe, let us know! Leave a comment, rate it, and tag a photo #minimalistbaker on Instagram so we can see. Cheers! Preheat oven to 375 degrees F (190 C). 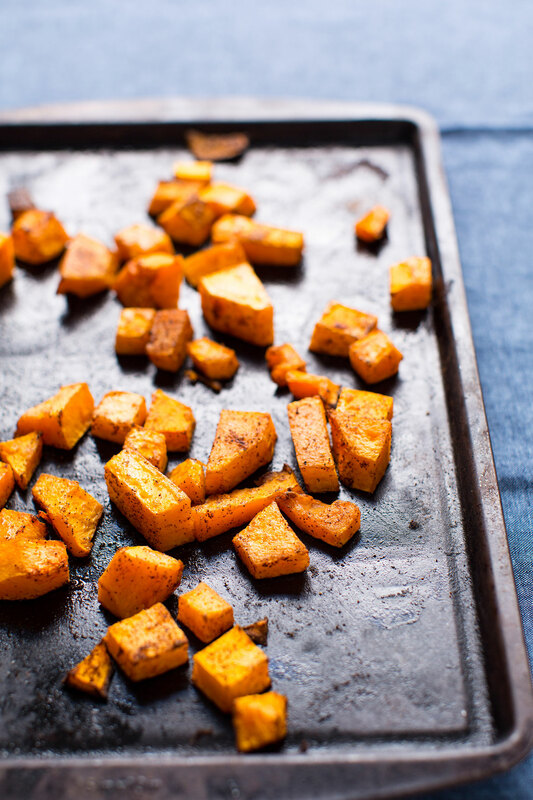 Add cubed butternut squash to a baking sheet and drizzle with oil, and add the spices. Toss to combine, then bake for 15-20 minutes, or until tender. Add beans to a small saucepan over medium-low heat and cook until bubbly, then turn off heat and cover to keep warm. In the meantime, prepare sauce. Heat large skillet over medium heat. Once hot, add oil, onion, and garlic. Cook, stirring frequently, until soft and slightly browned and translucent - about 4-5 minutes. Turn heat to low and add tomato sauce, diced chipotle pepper, adobo sauce, water, cumin, chili powder, and coconut sugar. Stir to combine and simmer for 5 minutes. Transfer sauce to a blender and blend well for a completely smooth sauce. Taste and adjust seasonings as needed, adding more adobo sauce for heat, water to thin, or coconut sugar for sweetness. Set aside. 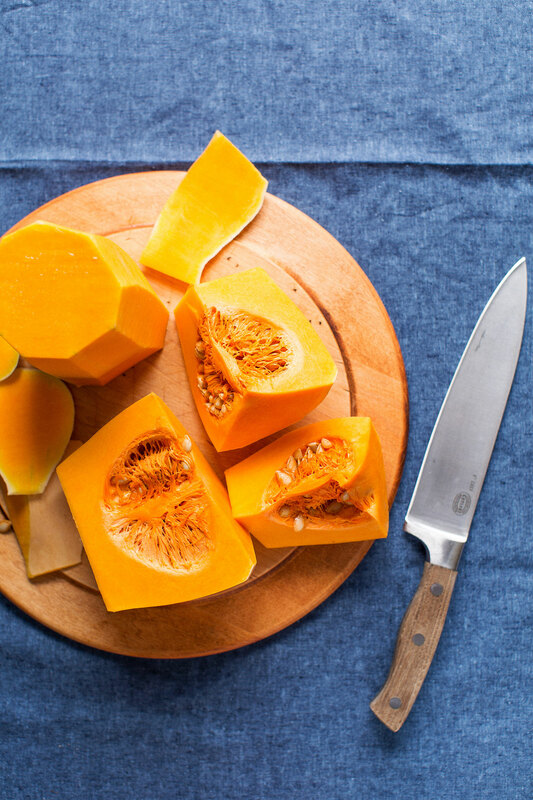 Once the butternut squash is nearly done roasting, heat a large skillet over medium-high heat. Once hot, add 1 Tbsp oil (amount as original recipe is written // adjust if altering batch size) and portobello mushrooms. Sauté for 3-4 minutes, or until softened and browned. Then add 1/4 cup (~60 g) of the Adobo Sauce (amount as original recipe is written // adjust if altering batch size). Sir to combine and cook for 2-3 minutes more. Then remove from heat and set aside. Add cooked butternut squash to a mixing bowl along with black beans and 1/4 cup (~60 g) of the Adobo Sauce (amount as original recipe is written // adjust if altering batch size). Stir to combine and set aside. Warm tortillas in the still-warm oven to 2-3 minutes, or wrap in a damp towel and microwave for 45 seconds to soften. Divide toppings between warmed tortillas and garnish with additional sauce (you’ll have leftovers*), diced red onion, and fresh cilantro (optional). Tacos are best when fresh - especially mushrooms. Fillings will keep in the refrigerator for 2-3 days, and sauce will keep in the refrigerator up to 1 week or in the freezer for 1 month (see notes for other uses). *Tomato sauce can be found at nearly every market, and is a blend of tomato purée with spices, such as salt, pepper, and garlic powder. However, if you can’t find it, just sub tomato purée and add more salt, pepper and a bit of garlic powder. *Leftover Adobo Sauce can be stored in the refrigerator up to 1 week or in the freezer for 1 month. It’s excellent as a sauce for tacos, or enchiladas, such as my Panko Baked Avocado Tacos, Spicy Plantain Black Bean Tacos, or Quinoa Taco Meat. *Nutrition information is a rough estimate calculated with all of the sauce and with black beans. Yes you did it again! This was delicious! Never tried butternut squash before (I know,criminal!) Thought it was rock hard to cut through and peel,but used a peeler and had no problems,cut through easier than sweet potato! This recipe was super tasty, but definitely needed much more salt than the recipe indicated. I put a healthy amount on the squash and the mushrooms and in the sauce after the fact because it was a bit bland without it. I served mine with some shredded cabbage and goat cheese and it was delicious! Wow~ I did not expect these to be as scrumptious as they were. Totally satisfying, tasty, saucy (that SAUCE though!) and filling. Great recipe and very easy. This recipe, like all of yours, was SO good. But the 30 minute prep is really more like two hours. I’m a very experienced cook in a very well equipped kitchen and it took me over two hours. Having said that, this would be a great thing to serve my non vegan friends who assume eating plant based is bland or boring. Really tasty. We have found a new go to family favourite recipe. So many flavours, truly stunning! Was looking for recipes to use up my abundance of butternut squash (grew some in my garden this year – got NINE – each yielding about 8 cups worth of cubed squash)! Found this one & tried it for dinner tonight. Loved it so much! Yay! Glad to hear that, Hayley! Wow! Just made these for dinner and we absolutely love the smoky mushroom goodness. The squash is a perfect compliment. We added the black beans and served with cilantro and more of the yummy sauce. Thanks for another fantastic recipe. Can’t wait to make them again! This was amazing! I made this last night and not only was it delicious it came together incredibly quickly! I loved the sweet/smoky flavor of the squash combined with the heat of the chipotle in adobe sauce. The only thing I might do differently is add more mushrooms. I ended up using cremini as they were on sale, but they were perfect! I added black beans for extra protein and topped with extra chipotle sauce, diced onions, cilantro and avocado. I am already dreaming about making this again. Thanks Dana – for sharing another of your amazing meals! I really want to try this recipe but I can’t seem to find adobo sauce anywhere!! I’ve been looking for 3 days.. is there a substitute or a way to make it at home? I hate vegetables. All veggies taste like mushy garbage to me. But then I found your site, and somehow you transform veggies into delicious, tiny morsels of goodness. I have tried and cooked new veggies following your recipes, and I’m hooked! This recipe is still my all time fave, it is amazing! This was excellent! I’m not a fan of mushrooms, so I followed another commenter’s suggestion in substituting chickpeas. I seasoned and roasted a can’s worth alongside the butternut squash (without changing the measurements of the oil or spices) and it was perfect! I also used yellow onion instead of white, added the beans, and heaped in some extra chipotle peppers without ever dicing them. And PS – a single $1.99 bag of cut butternut squash from Trader Joe’s was more than enough for this recipe. Soooo good and very filling! I can’t wait to make this again! loved it, once I saw the recipe I knew I had to make it. i was so happy with the sauce, I was worried it would be too spicy but the maple syrup helped even it out. What coconut oil do you use? I feel I use the wrong kind, when cooking it often leaves a coconut flavor. These tacos made for an excellent Halloween dinner. As we didn’t have any tomato sauce on hand, I put a can of diced tomatoes in the blender and that worked out fine. Our sauce was not as thick as the one you have pictured but it tasted great. I love this recipe and will surely make these tacos on a regular basis. Thanks Dana! Would frozen butternut squash work if I thaw it out? Hi Stephanie! That should work! Another winner! Does need something cool – a crema or guacamole. Lots of leftover sauce to be put to good use. Hi :) I am so excited to try this recipe! But I have frozen, cubed butternut squash. . . Is it possible to use this for your recipe? Hi! That should work, just make sure to check if the squash is cooked after coming out of the oven, you may have to cook it longer as you are cooking it from frozen. I am new to Vegan cooking. I love you site. I have been doing this for 9 days. Everyday I have secretly substituted my family’s usual foods with vegan food. (lost 8 lbs already too). Your food looked fantastic and your reviews were strong so I thought why not? I have yet to be disappointed. Served the tacos tonight and ended up making extra of the squash as a side dish. It was so amazing! Thanks for all that you are doing. I made these tonight and my two young boys gobbled them up with me. They’re so delicious and EASY to make!! I froze the extra sauce in 1-cup portions to pull out for other recipes. Excellent dish! Fantastic. Made it for dinner tonight. Will be making it again soon for neighbors. Thank you! Unfortunately, this one didn’t work for me. 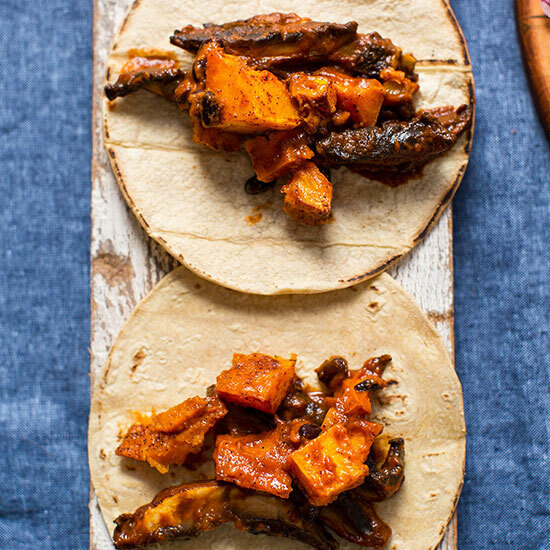 The sweetness of the squash and savory of the mushrooms didn’t taste good to me nor my husband which is surprising because we love tacos, mushrooms and butternut squash individually. I wouldn’t make this again but still there are amazing recipes on this website that I’ve made over and over again. Just made these tacos tonight and they were amazing! The sauce is fantastic and addictive! I’m already thinking of other uses for the left overs. Great recipe, Thank you! I can’t eat adobo…is there anything else I could substitute for the adobo? Love, love, love these tacos! So dank and flavorful, healthy yet filling. I recently started cooking vegan and had my friend help me out tonight. We baked some sweet potatoes too with the butternut squash and sprinkled some brown sugar as well. Really wanted to try and balance the spiciness from the awesome adobe sauce. Although, I did dabble some Cholula hot sauce in it too – came out amazing! For the final touches, we topped off the tacos with black beans, greek yogurt (I hate sour cream) & guacamole! Will definitely be making these again. They were a hit! That sauce. I could eat in with a spoon (definitely NOT doing that right now…). I roasted chickpeas as the same time as the squash. They give a wonderful crunch to the whole thing. I’ve tried it with mushrooms too though and loved it that way too. Oh. My. God. These are incredible! I used some leftover enchilada sauce from a different recipe as a base and blended in some extra chipotles and adobo sauce. These are THE BEST plant-based tacos we’ve ever tried–for lunch today, I mixed some leftover taco filling in a bowl with quinoa and sliced avocado (equally delicious). I can’t wait to make these again! This looks delicious! I don’t have great tolerance for spice though. What would you suggest doing to make this less spicy? Thanks! I made these last night. Delicious! I also made the chimchurri sauce from your portobello mushroom steak recipe, and OH MY GOD the chimchurri sauce brings out the flavour of the mushrooms like crazy!!! I also added corn to the black beans, and vegan sour cream. We made burritos instead of tacos…. and I’m still dreaming of them!! Thank you. Made this and it was delicious!! Thanks for such amazing & inspiring recipes! I have made this so many times and I love it. One of my go to vegan recipes. Love the meaty rich taste of the mushrooms with delicious Mexican flavors. Very tasty! Made them last night. It yielded about 3 tacos (but we like…LOVE tacos). Perfect for our dinner and lunch the next day. This is the second Minimalist Baker recipe we’ve done this week incorporating chipotles and it really has been a GAME CHANGER in our kitchen. Love all of these recipes! I’ve never been disappointed in one! The recipe of your Butternut Squash is awesome. We make a lot of your recipes! I’ll definitely be trying this soon. Whereas this squash has made of protein and fiber so it’s a very health food for people specially for me. Definitely I will make this recipe for my family. I have a question what can I use instead of Adobo Sauce. Please Reply me and sharing your recipe. Made this last night-delist! Rave reviews from the husband. Didn’t have time to take pictures (it was late and we devoured it) but it was great! Amazing recipe! I added sour cream and diced avocados as I love something creamy with the spicy. I used two peppers in the sauce and sliced baby bellas to account for having only two ‘big’ bellas. Delicious, hearty, and tasty! Raising my 3 beautiful babies (2 with food allergies) on your delicious plant based whole food goodness! Every single thing I’ve made from your blog or cookbooks has been a hit! So very grateful to you for the work you do. Everyone I know is getting your cookbook for Christmas! These were extremely good. I used about 1.5 tablespoons of the adobo sauce from the can instead of the 1 tsp because I generally like things more spicy. It really didn’t turn out all that spicy. It has a nice smoky, mildly spiced taste. It tastes very unique. It reminded me of something I would get from a fancy restaurant. I would highly recommend this. My wife doesn’t like anything squash related and after a few bites she looked at me and said “I can’t even taste the squash!” A friend of ours made it as well and she said “it was life” so she must have liked it too..
It’s funny how the names of different foods differ across countries.. I’m from South Africa and we refer to ketchup as tomato sauce. So reading your recipe, my first reaction was quite shocked to see that you would use ketchup in a recipe, only for me to realise that it’s a completely different product you’re talking about! Oh, but the recipe looks delicious though!! I think I’ll have to try it sometime soon. OMG! I made this last night and couldn’t believe the taste! So rich, flavorsome and delicious! This recipe was amazing!!! I am trying to cut down my meat intake, and it is hard to impress my family with vegetarian meals. But this recipe really amazed my family. The sauce was incredible. I am looking forward to making these again. Thanks so much! These were delicious and easy once i got the squash peeled. Great use of veggies i had in my house and creative! Loved it! Where would I find the pepper in adobe? What store and what aisle? Cans? It’s usually in the Mexican foods aisle! This is going on the menu this week for sureeee! I’m not a huge fan of portobellos but when you cook them up like this oh man, they’re so good. And I’m already on a butternut squash bender, so might as well keep that rolling. And…tacos. Can’t wait to try these! Thanks, guys! This was delicious. This is the second recipe I have made from Minimalist Baker. The first was the spicy chick pea Buddha bowl. I made that several times and my guys who are not vegetarian loved it. Absolutely love this web site and the gorgeous photos. Today I am going to make the one bowl pump cake which looks yummy. Thank you! Honestly, since I made this I haven’t stopped craving it again. My first go at vegan tacos and I fell in love. I have a whole new respect for butternut squash! It really is so diverse. To top it off, the sauce is amazing! Smoky, smooth, just the right amount of spice. It compliments the portobello and squash perfectly. Topped with cilantro, this was an instant favorite. Looks so good. I love portobellos in tacos, especially with smoky seasonings. I suspect you could just toss in the mushrooms to roast with the sweet potatoes, no? Then you could add the sauce or whatever other sauce you like. What skillet do you use? Tomato sauce?? No ma’am. SW’ers are crying. Buy a bag of dried red chile pods, soften them in boiling water then puree in blender. These were so ridiculously good. I swapped roasted sweet potatoes for butternut squash and topped them with a quick avocado crema. Perfect amount of smokiness and spice. Will definitely make again! Yum! What a great combo! At first glance, I thought it was chicken cubes! Wow!! This looks sooo good. I love mushrooms and will definitely give this a go! These were yummy, I love this spicy sauce! I didn’t have any mushrooms, so just used the butternut squash, black beans, and roasted chickpeas and it was delicious. Added some extra heat to the sauce with a can of Rotel. So easy and delicious :) I’m enjoying working through your recipes. 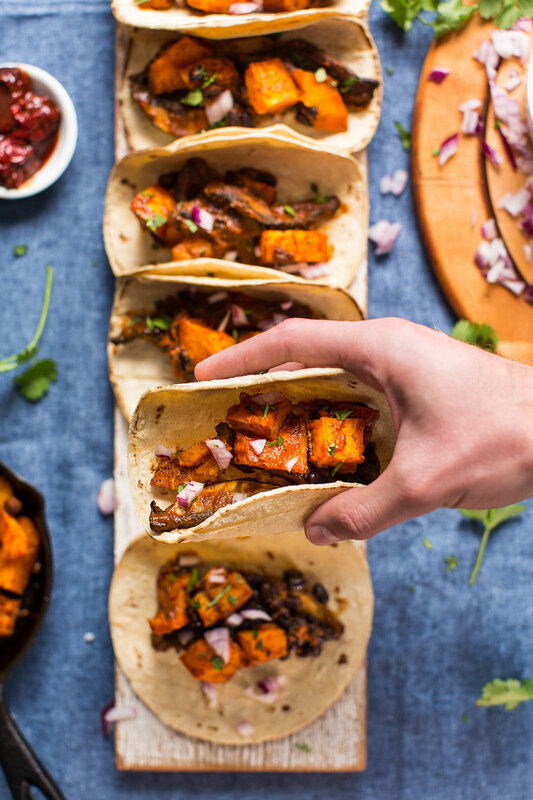 Not sure what I like more about this recipe – the fact that it features my most favourite foods (butternut squash sand portobello mushrooms), or that it is one of the easiest vegan taco recipes! Thnaks so much for sharing! I also can’t find it in the UK. Any suggestions for substitutes? I believe l saw some in Tesco, Sam. I found some in the Mexican section in Woolies, and I’m in the NT….. This is my kind of food. Gotta try this! Ha—when I read the opening line, saying “there are no words,” I thought it was going to be an election rant! My yoga class helped me achieve a level of equanimity, so it was so much better to read and see that fabulous recipe. 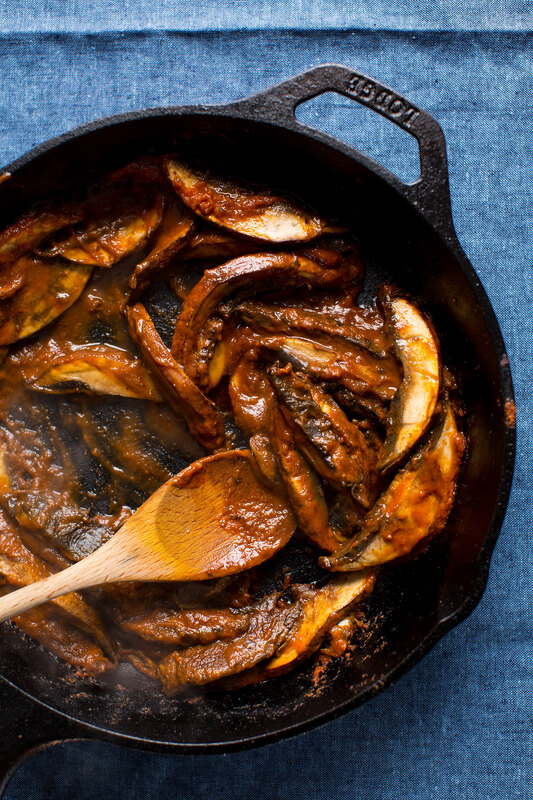 Squash, mushrooms, and black beans in adobo sauce—perhaps that’s what America needs right now. Or at least me. Healthy, delicious vegan eating is definitely my way of coping and celebrating what’s right/good. Thanks! Looks amazing – do you make your own tortillas? I’ve been told that once you make your own, there’s no going back. I don’t! These are from Trader Joe’s. I have to second that sentiment. I live pretty far from TJs and whole foods so I was sort of forced into needing to make my own because I can’t tolerate all of the preservatives. It’s SO easy if you have a press, and super cheap, and AMAZING tasting. It’s hard without a press (I tried that craziness for a while), but if you’ve got a good one it’s shockingly easy and so worth it. O The sauciness!!! That sounds so good! Just made this very yummy recipe. The sauce is awesome… And this is the first time I’ve ever really eaten Butternut squash. Mushrooms were meaty and let’s be honest I really need the vitamin D. This will be a regular recipe item on my repeat list. Thank you for the recipe!